Originally appeared in the Burlington County Times on March 24, 2013. 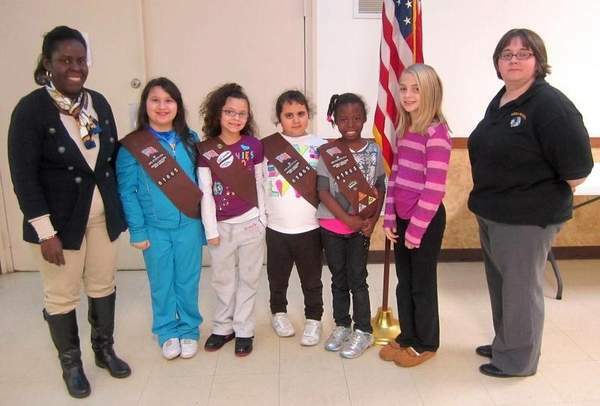 Girl Scout Troop 21509 of Lumberton at the Lumberton Village Green on Saturday. from the Easter egg hunt the girls organized at the Village Green on Saturday morning. LUMBERTON — How long does it take a group of young children to clean up an entire field of plastic eggs? 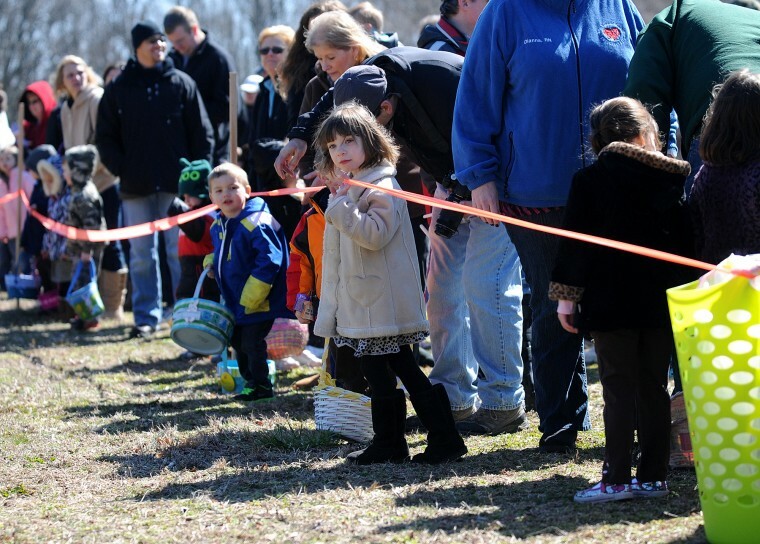 The scramble was on as an Easter egg hunt was held at Village Green on Saturday. A few hundred children raced across the grass to gather as many eggs as their plastic buckets could hold. The event, which was hosted for years by the Lumberton Recreation Department, was canceled two years ago because the department was disbanded due to budget constraints. On Saturday, the Easter event was revived by a group of nine local Girl Scouts who are hoping to earn their Bronze Awards for community service. Judging by the smiles and loaded Easter baskets, their task was completed. After the air horn signaled the start of the festivities, children raced across the fields snatching up plastic eggs with goodies inside. Children were separated into three age groups to keep the event fair. 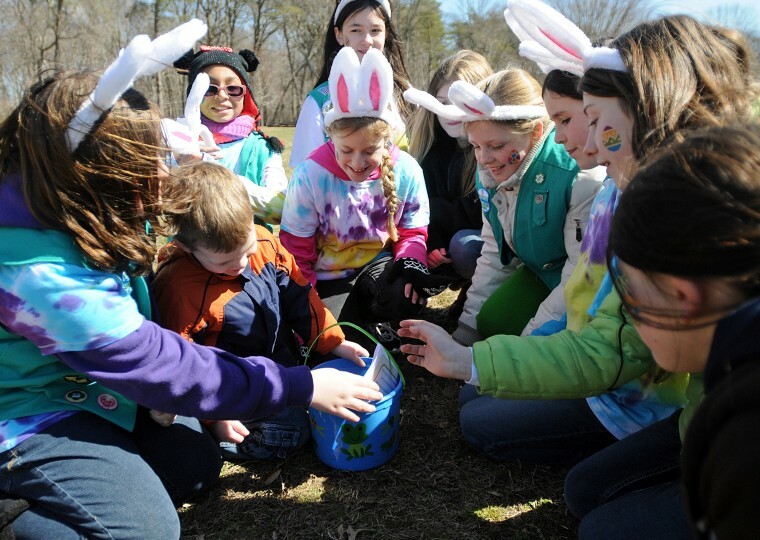 Though the actual event took just minutes for kids to gobble up more than 4,000 eggs, the planning and preparation took the brunt of the Girl Scouts’ energy. Joining Mikhala in the project were twin sisters Faith and Shannon O’Donovan, Kim Platt, Julia Gallo, Jenna Frenzel, Alex Green, Gabriella Cline and Avery Myers. The girls gathered donations from local businesses and helped advertise the event, gaining the attention of area school children. They also stuffed plastic eggs and help set up the hunt. They even convinced the Easter Bunny to make an appearance to pose for photos with kids. Their efforts became a big crowd favorite. 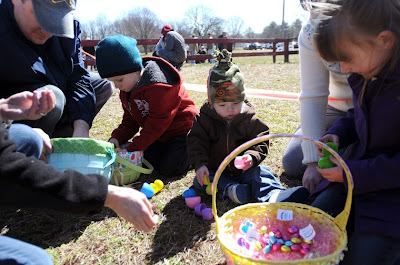 after an Easter egg hunt organized by Girl Scout Troop 21509 at the Village Green in Lumberton on Saturday. It’s one thing to grab a bag of potato chips. It’s another thing to make your own snacks. Better still, teach your children to whip up their own treats. That’s what young girls who are members of Brownie Troop No. 61665 in Buena Vista did recently. Mom Amber Burke-Yarbrough, mother of Alivia, age 7, likes to teach her little ones a few basic skills in the kitchen. Yarbrough, a member of The Daily Journal’s Food Advisory Board, helped Collings Lakes troupe leaders Kristina Reed and Lurleen Bowie. The Brownies were charged with coming up with an easy snack recipe they they could create with minimal help from an adult. The reward? The Brownie snack badge to prove they had met the goal. Yarbrough’s daughter, Alivia, appreciates a variety of different dishes, so the snack she chose from mom’s considerable collection of cookbooks was more savory than sweet. The up side of teaching her daughter to make her own snacks is that Yarbrough can control the food that her daughter eats. Instead of going with microwaved popcorn, she uses a stovetop popcorn maker called a “Popstir,” which resembles a smaller version of the popcorn maker found in movie theaters. Making her own popcorn saves plenty of money — a single bag of kernals can last three months or longer. It also has very few preservatives or additives. The kernals can be air popped or made with a bit of coconut oil. “It’s fun. The kids get such a kick out of it,” Yarbrough said. Another bonus: Getting her little helpers to make their own snacks — and meals, for that matter — encourages them to eat what they are making. and Annalysse O'Donnell of Buena and troop leader Kristina Reed of Collings Lakes. Directions: Preheat oven to 350 degrees. Stretch out 1 uncooked biscuit at a time and place on cookie sheet. Place a tablespoon of Sloppy Joe mix in center of biscuit. Top with 1 tablespoon of cheddar cheese. Fold biscuit over to one side to create a pocket. Seal edges with fork. Bake for 17 minutes at 350 degrees. Directions: Place popcorn in large bowl. In a small bowl, stir together butter, chili power and garlic. Drizzle butter mixture over popcorn. Sprinkle with Parmesan cheese. Store in tightly sealed container for up to three days. Place 1 tablespoon of yogurt in clean ice-cube tray. Top with four to five blueberries. Place toothpicks in center of each yogurt filled ice-cube section. Freeze overnight, then pop them out and enjoy them. 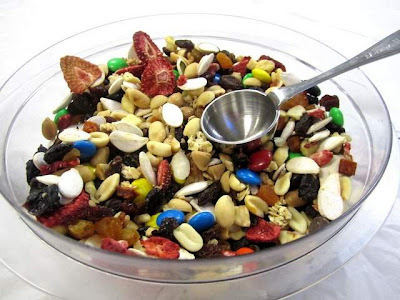 Combine all ingredients in bowl, then store and seal in a container.